Last night, I was biking home on Irving Street in the Inner Sunset when I encountered an all-too-familiar sight: A double-parked car. I signaled and moved to the left to pass the car, in view of an SFPD cruiser behind. Normally, I’d expect the police to move along, doing nothing about this kind of situation. Other bicycle riders have reported far worse encounters with the SFPD. But to my surprise, the driver of the police cruiser stopped behind the double parker and used their horn to buzz at them until they moved. This might seem like a mundane encounter, but it left an impression since it’s so rare. I’m just not used to police actually caring about drivers who pose hazards to people biking or walking, or delaying Muni, even when the behavior is clearly illegal. Usually they just move along. 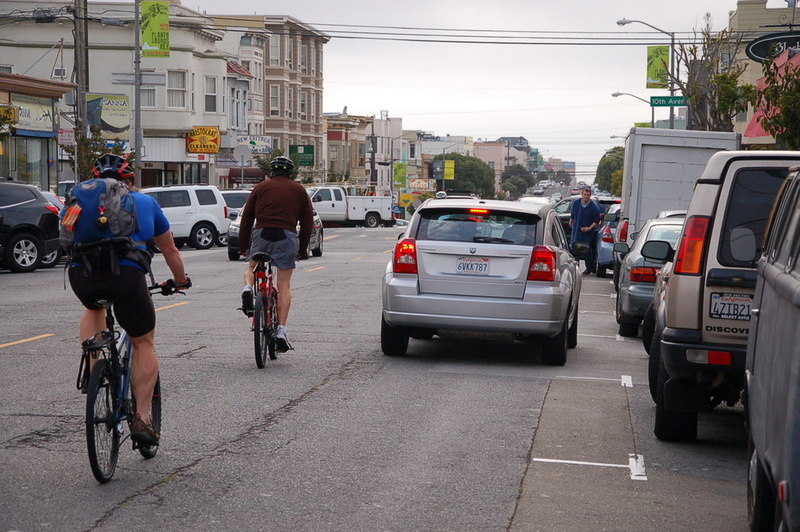 When you get around by bike in SF for a while, it’s something you sadly can come to expect. Perhaps it’s wishful thinking, but if SF is fortunate, this officer’s little deed is not just a sign of a good apple, but rather of a larger shift in priorities at SFPD. Maybe it’s related to recent pushes from the top to pursue Vision Zero, or to crack down on double parking. Of course, citations might be more effective, but whoever the officer was — presumably from Taraval Station — thank you. The little things can speak volumes about SFPD’s attitudes. Police need to be on agile machines to really bust the driving scofflaws: traffic enforcement should also be done from bicycles or the small “enduro” motobikes SFPD sometimes uses. Regular police cruisers, or fat motorcycles, can’t move well through traffic to actually bust the jerks who do the dangerous driving. How can we pressure the SFPD to use the right tool for the job? How did we get to this point where we are now writing articles to commend police officers for NOT doing nothing?? All this guy did was honk at a double-parked car until it moved… something that any non-officer could also have done. What about doing something that non-officers cannot do, such as issuing the double-parker a citation? Wouldn’t that be more along the lines of the police officer doing his actual job? I’m sorry, but this kind of nonsense really gets under my skin. It’s gotten to the ridiculous point where police officers are now getting praised for doing LESS THAN what they are actually being paid to do, which is enforce the law and issue tickets to people who are violating the law. Wake up people! I’m not sure why this blog is praising them for their non-action. Double-parked cars make Irving even more dangerous as they push cyclists perilously close to the N-Judah tracks. The officers didn’t cite the driver — they just reinforced the mentality that double-parking is okay. At best, you’ll get away with it. At worse you get honked at by a cop. Contrast this behavior with my experience from two weeks ago. I was on my bike at a red light at the 7th Ave. and Irving intersection. Next to me was a patrol car with two officers in it. As the cross-traffic signal turned red a car came barreling through the intersection. Of course, even when I pointed it out the officers simply shrugged at me and drove off. Heartening I guess, but in the meantime, I found myself two days ago wishing there were an actually effective method to report SFPD cruisers’ violations of right-of-way when I saw one blatantly sail past someone trying to cross at 19th/Dolores. I just know when I call the Mission station that the dispatcher is just shrugging and not writing anything down. I agree. A month ago I called in to SF Parking a vehicle double-parked and blocking a bike lane and car lane on Golden Gate Ave. near USF: https://twitter.com/cjerdonek/status/507715737327128576 . I waited 15 minutes, and when SF Parking came, they didn’t cite them. They just told the owner to move the car, and then the officer waited around 10 minutes for them to move. You can go online to the web site of the individual station, see who is in charge of that station, call the station and request to speak to that person about it. I left a voicemail and received a personal call back telling me how they were correcting the issue I called about and apologizing for it.